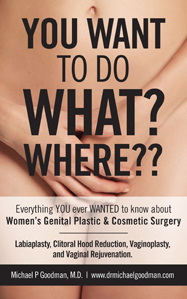 Dr. Michael Goodman specializes in difficult gynecologic issues, peri-menopausal medicine, lifestyle enhancement, sexuality issues, bone densiometry, labiaplasty and other vulvovaginal aesthetic surgeries. Stanford University trained in obstetrics and gynecology, Dr. Goodman is also a critically acclaimed author and pioneer in the development and advancement of Minimally Invasive Gynecologic Surgery. Through his private practice and writings he focuses on patient education and involving patients in the therapeutic decision-making process.